The days are dreary, wet and cold but if you’re here this weekend anyway, why not enjoy some time enjoying the best decadent treat there is at the Chocolate Fair in Piazza Santa Croce? Even with the rainy weather, the fair goes on under tents. The fair started yesterday and goes on through Sunday, from 10 am to 10 pm. There are stands from local chocolatiers from Florence and Tuscany but also from the rest of Italy as well as France, Spain and Belgium. Here is an idea of some of the free tastings or events available but, since space is limited, go ahead and email info@fieradelcioccolato.it right away to reserve your spot!! From Friday through Sunday: in the afternoons the consortium of Maremma Milk Producers will be offering children free samples their new line of milk snacks called “Fresca Bontà” while throughout the day free tastings of fresh whipped cream will be offered , perfect with chocolate! 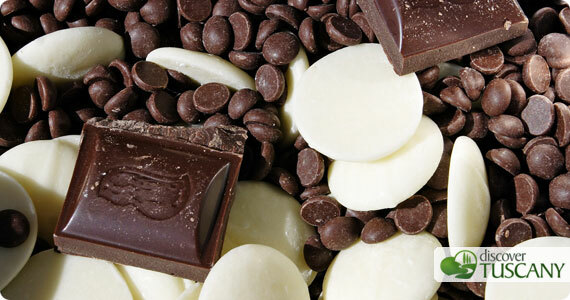 Tastings of how chocolate is used in the kitchen, from savory dished to desserts. Only 20 spots, reserve your place by emailing the address above. The local RDF 102.7 radio station will be interviewing participants and asking their opinions. Free gadgets for everyone! “Lo spettacolo del gusto”: Simone de Castro and Rossella Gatti from the artisan workshop l’O located on Via Pietrapiana, 44r experiment with chocolate to create new and exciting tastes and matchings. 6 experiements on each night for a total of 12 different symphonies of aromas and tastes. Each participant will receive a gift. Reservations required by email, cost is € 10,00, 30 spots available. In front of the church, a short class of streching and easy exercises and at the end all participants will receive a classic energetic snack: bread and chocolate. Participation is free as long as you register by email, 30 spots available. 2 p.m. in front of church again, the Company of the Red Wolf will exhibit a mock battle with medieval swords with active participation of the public. Winners of Florentine Sweets will be announced by the major. Tastings of the winning sweet will be available. Second evening of the “Lo spettacolo del gusto” as above for Friday. 30 spots, free participation, book your spot through email.